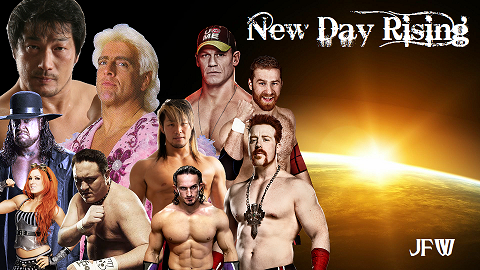 Live from the O2 Arena in London, England, JurisFiction Wrestling presents...NEW DAY RISING! Chris Hero’s long rivalry with JFW CEO Mr Swiss finally came to an end last month at JFW Rebellion, as Hero defeated champion John Cena and Mr Swiss’ “Chosen One” Tyson Kidd in an epic Triple Threat match to become JFW’s reigning Omega Champion. On the following episode of JFW Ignition, Mr Swiss acknowledged Hero’s win, but had one last twist in the tale for the Knockout Artist. He announced that Hero would have to defend his new title at New Day Rising, against Kidd, Cena and two qualifiers, in a King of the Mountain match – a match in which no champion in JFW history has ever retained their title. The animosity between Hero and Kidd is well known, but at Rebellion Kidd also incited the wrath of Cena via use of a low blow – a move technically legal in a triple threat, but which Cena saw as dishonourable, and blamed for his title loss. One week later, Harley Race shockingly betrayed tag team partner Sting by abandoning him mid-match, and then issuing a vicious beatdown afterwards. Race announced that he was partnering with someone who could really help him – Mr Swiss. Swiss had offered him an extra spot in the Mountain match, along with a fat bonus payable if Tyson Kidd won. A furious Sting entered the qualifying tournament, vowing to wreak his revenge by preventing Kidd and Race from winning the Omega title. His emotion carried him through to the match itself, and he has now guaranteed he will make Race and Kidd spend the entire match sitting in the penalty box. Meanwhile, Race and Kidd attacked Hero and Cena in the ring, with Kidd lifting the belt above them…only for Race to stare him down. Race grinned and ruffled Kidd’s hair before turning away, but he left Tyson feeling distinctly uneasy about his new alliance. The other qualifier proved to be high flyer Kota Ibushi, who felt that his lack of personal issues with the other competitors gave him the edge, as he could focus completely on his strategy. And so it proved when the men met in six-man tag team action on Ignition – when a brawl broke out between the other five, Ibushi came out of nowhere to score the pinfall for his team. What matters more to John Cena – revenge, or regaining his title? Will Harley Race’s deal be the difference maker for Tyson Kidd, or is it a masterplan worthy of Machiavelli himself? Sting is on a one-man mission to deny Kidd and Race, but if he sees an opportunity for gold, will he be distracted by it? Chris Hero has fought through impossible odds already to gain his Championship, but does he have it in him to do so one more time? Or will the dark horse Kota Ibushi steal it from under his nose? Only the match will tell. At Rebellion, the Straight Edge Society would interfere in the Tag Team Championship match by attacking challengers Beer Money, Inc to prevent them from winning the belts. The SES claimed the titles should be around the waists of role models – and that they actually had no problem with Beer Money being champions, as long as they were willing to reform themselves and give up drinking. 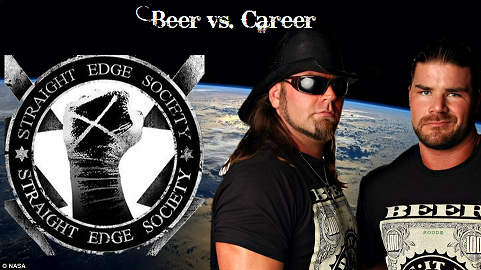 They challenged Beer Money to a match with SES representatives Luke Gallows and Joey Mercury, claiming that if the SES won, it would prove that the straight edge lifestyle is better and Beer Money should give up drinking. Beer Money wanted revenge and so accepted the challenge - but they pointed out that bets work both ways, and according to the SES’ own beliefs, if they couldn’t beat a pair of drinkers then they didn’t even belong in the company. With the agreement of JFW CEO Mr Swiss, the match was made – if SES wins, Beer Money will have to give up drinking, attend AA meetings, and change their name to Save Money, Inc. If Beer Money wins however, the SES will be forced to leave JFW. Over a year ago, at Rebellion 2015, Becky Lynch captured her first Women’s title. She has held it ever since, breaking through the one year barrier at this year’s Rebellion. Her next target: the longest reign on record, currently held by former JFW star Manami Toyota. The week after Rebellion, Toyota sensationally returned to JFW Ignition to defend her record, telling Lynch that “you can’t expect to beat the record without beating the record-holder”. Lynch is due to overtake Toyota on the episode of Ignition following New Day Rising, so Toyota challenged her to one more title defence at the pay-per-view to prove she deserves the record. Lynch came out to accept, and for the first time ever, the two superstars shared a JFW ring to duelling chants of “Let’s go Becky!” and “To-yo-ta!”. As if their epic first ever match wasn’t enough, there is a further wrinkle in the tale; Toyota is a two-time JFW Women’s champion. No one has ever held the belt three times. Will Lynch become the longest reigning Women’s champion ever? 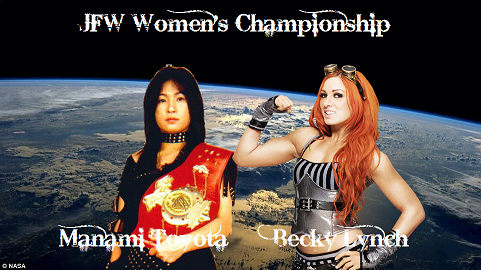 Or will Toyota not only defend her record but also become the first ever three time Women’s champion? Either way, records will be broken in the epic first ever match between Becky Lynch and Manami Toyota. Kobashi and Sheamus first met during the tournament to enter the Omega Championship King of the Mountain match. During the second-round match, Sheamus poked an unseen thumb to Kobashi’s eye, giving him the opening to win the match. A thunderous Kobashi demanded satisfaction, but Sheamus claimed Kobashi would never get it, as he only knew how to wrestle, not how to fight. In fights on the streets of Dublin, Sheamus learned not to wrestle, but how to inflict pain. The following week, Sheamus would lose his final qualifying match to Kota Ibushi, after which Kobashi came out of the crowd, steel chair in hand. After laying out the Celtic Warrior with venomous chair shots, Mr Puroresu spat in Sheamus’ face and told him to turn up at New Day Rising ready for a No Disqualification match. Can the dojo-trained technician adapt his style enough to defeat the brawler born on the streets of Dublin? Find out at New Day Rising! After Sami Zayn vs Ric Flair became official, Mr Swiss announced the plan to identify the eventual champion’s first challenger after New Day Rising. A pair of mini battle royals were held, with the winners facing each other in a best of three series to determine the next number one contender. 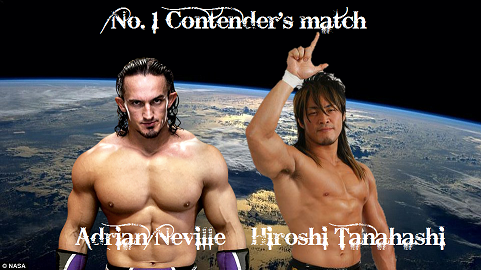 Those men were Adrian Neville and Hiroshi Tanahashi. Neville has been around the world title picture before, and appeared not to be worried about Tanahashi, relatively inexperienced at this level, seemingly considering the result of the series a formality. However, in their first match, the fervent fan support for the Japanese seemed to unnerve the Man That Gravity Forgot. Tanahashi would capitalise and stun the Brit with a small package for the victory. Neville panicked. Vague threats and angry outbursts at his opponent made fans wonder if he would resort to nefarious tactics to secure an equalising win in match two, but as it was he came out with a different game plan, more hard hitting and grounded than we usually see from the high flyer. It paid off as he nailed Tanahashi with a bridging German suplex to force a deciding match. Interestingly, neither man has yet been able to hit their biggest moves in either match, each attempt so far being successfully countered. It could well be the man who finds a way to do so who leaves New Day Rising victorious. 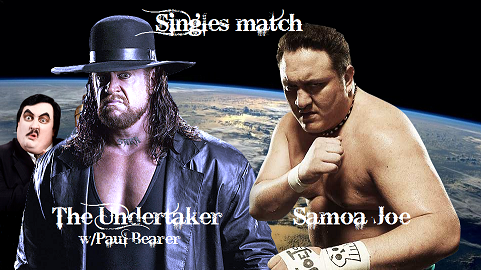 Ever since Samoa Joe arrived in JFW nine months ago, no one has been able to defeat the Samoan Submission Machine. His undefeated streak has seen him pin or choke out every opponent thus far. The Deadman meanwhile, has had mixed fortunes lately. Efficient wins have been balanced out by some big losses, most recently to Sami Zayn in a number one contender’s match. On the other hand we are heading into New Day Rising, an event at which Undertaker has never lost – yet. Left without a clear match for New Day Rising, Joe demanded a shot at the Phenom’s streak, promising to extend his own by ending another. For weeks Joe ran his mouth against Undertaker, eventually goading the latter into agreeing to a match. At the contract signing, Joe raised the stakes even further – handcuffing Undertaker to the ring post and forcing him to watch as Joe sadistically choked out Paul Bearer, leaving the Deadman’s guardian in need of hospitalisation. Joe would continue to get the upperhand in attacks on his opponent during the following weeks, until one week before New Day Rising, in the middle of another in-ring attack by Joe, Bearer returned! A revitalised Undertaker then delivered a hellacious beating to Joe, leaving him down in the ring after a series of Tombstone Piledrivers. Undertaker promised that as Joe had made things personal, he would take the only thing that matters to Joe away from him. Can the Deadman summon the invincible aura that surrounds him at JFW’s premier event, or is Samoa Joe so unstoppable even the unbeatable can’t overcome him? For ten months Ric Flair has held an iron grip on the JFW World Heavyweight title, retaining the championship by any and all means necessary. Fan-favourite Sami Zayn meanwhile, has been fighting long and hard to earn his opportunity at the big one. After months of almosts, could-have-beens and setbacks, Zayn finally defeated The Undertaker to become number one contender to Flair’s belt. Flair and Zayn have met numerous times in their career, with Flair currently holding the advantage. The Nature Boy addressed this on JFW Ignition, claiming that heart and fan support will carry you so far, but as his record against Zayn proves, only superior strategy can beat the best. A week later, Flair violently made his point with a brutal attack on Zayn. Targeting Zayn’s left leg with every weapon available, the Nature Boy then locked in a lengthy Figure Four, damaging Zayn’s tendons. Out of action until New Day Rising, Sami vowed to fight in the title match whether his leg was 100% healed or not. But has Flair’s notorious cunning already won the day? 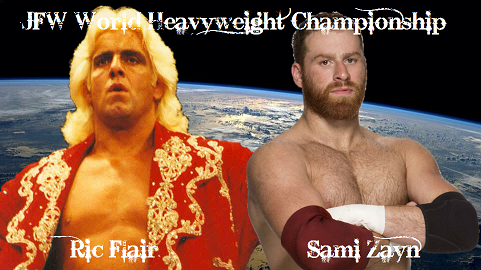 Or will Sami’s heart and determination power him to his first ever World title? Had to go with JFW's New Day Rising. While RWF's card is good, some of the matches just kind of lack that "special feel" to them. New Day Rising has a better mix of hard hitting, high-flying and technical action than Peril In Pennsylvania. And the winner of this war is...JFW! The next round will be up soon.